Kate Middleton, the Duchess of Windsor, just had her third child. They are all healthy, and I'm happy for that. They will get the best medical care England can offer for their entire lives - because they are Royalty. If they ever have a health problem that English doctors and hospitals can't handle, they will be flown by government jet at government expense anywhere in the world to get help. They will always have access to the top specialists in the world. And she and her husband, Prince William, will always have complete control over any health decisions regarding their children. Kate Evans is considered a Commoner in England's class-conscious society. She and her child Alfie don't have the same rights and privileges as the Duchess and her children. When Liverpool doctors decided her son should die, Alfie's parents had no say in the decision. Even though the doctors had no diagnosis, they decided in their great wisdom that Alfie was going to die and that nothing more could be done for him. To be fair, they did all they could to help Alfie. But when they decided it was time to "pull the plug," that was that. Alfie's parents tried desperately to save their son. They went to court after court, filed appeal after appeal. But the Courts sided with the Socialist death panel of doctors. They refused to allow Alfie to be taken to Italy, where a prestigious hospital had offered to help Alfie. After all, it would embarrass the vaunted NHS (National Health System) if they were proven wrong and Alfie lived. So the baby was sentenced to death. The wise doctors decreed that Alfie would die within 5 minutes of being removed from the ventilator. 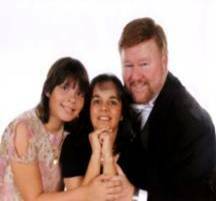 They took him off life support, and he surprised the docs by living five days. Alfie and his parents were fighters. They gave him mouth to mouth, they begged for help, but the hospital ignored them. They were betrayed by the hospital, the courts, and the government. So Alfie died this morning - as ordered by the British government. The Pope intervened. He arranged for Alfie to be granted Italian citizenship, and had a jet with doctors and nurses standing by for days in case England repented. Two powerful British women, one a mother herself, were conspicuously silent during the months of torment the government put Alfie's parents through. Queen Elizabeth II and Prime Minister Theresa May have tremendous power and influence, but they did nothing to save Alfie. When it was clear that the doctors were wrong, and Alfie had been stable for several days after being removed from life support, the boy's parents asked to be allowed to take him home. Can you imagine having to ask permission to take your own child out of a hospital? Again, the hospital refused, dragging their feet until Alfie expired. Let me make one thing clear in my comparison of the two Kates in this column. 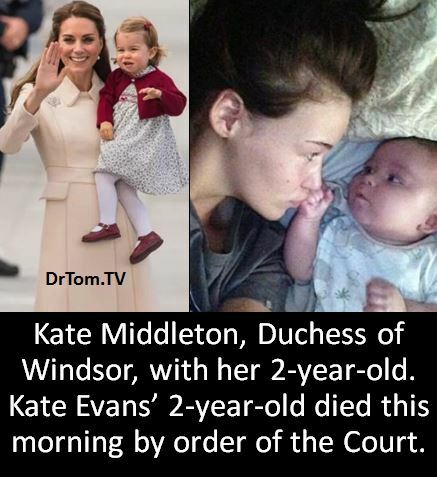 I do not begrudge Kate Middleton the best care possible for her children, nor her ability to choose the care she thinks best for them. I just wish England gave Kate Evans and others like her the same freedoms. I’m not saying that the nation should pay for the very best possible medical care for every person in England. That would be impossible financially – and that is the greatest argument against the evil that is Socialist government-controlled health care. I simply believe that God has given parents the authority over their children in His Word, and the government should not act as if they own our children. In that article, I asked for prayer for Alfie. I now ask you to pray for his grieving parents. And please pray that England's culture of death, in which they believe they can decide who lives or dies, will end. Any government which assumes totalitarian powers as England has done is destined to crumble from within.